An unmanned NASA spacecraft is set Wednesday to make its closest and deepest dive ever into the icy spray coming from the underwater sea on Saturn's moon, Enceladus. The minute moon circling the sixth planet from the sun astounded researchers when they discovered it had an icy plume back in 2005. After years of observations and collecting data, NASA declared earlier this year that Enceladus certainly has a subterranean ocean, spreading the hunt for alien life in our solar system. Although the Cassini probe's flyby on Wednesday will not be able to discover if there are life forms in the spray, researchers are certain that the close pass will provide them new perception into the habitability of the extraterrestrial ocean. NASA recently said in a statement "This daring flyby will bring the spacecraft within 30 miles (48 kilometers) of the surface of Enceladus's south polar region. The encounter will allow Cassini to obtain the most accurate measurements yet of the plume's composition, and new insights into the ocean world beneath the ice." The flyby would take place at 1522 GMT on Wednesday, however the scientific data it gathers may not be issued for months. 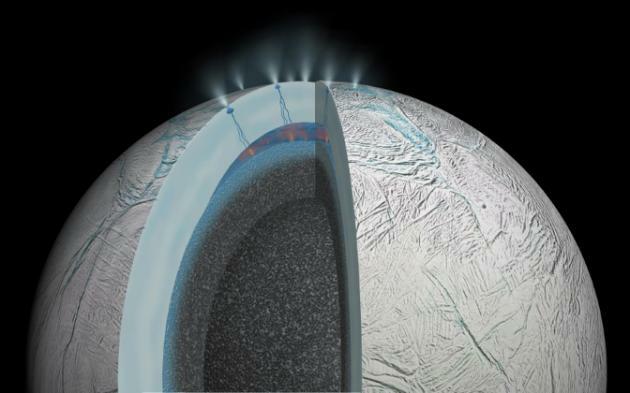 Researcher’s hope that the journey will tell them how much icy material is originating from Enceladus, and maybe what kinds of compound organic molecules it comprises, however not with enough detail to regulate if anything is alive. The $3.26 billion mission is a combined mission by the US space agency, European space agency and also the Italian space agency. Cassini is the first spacecraft to circle Saturn, and it has been orbiting the planet since 2004. It is making a series of flybys of Enceladus, counting a last pass in December.